The Best Dirt Biking Trails in the United States! As dirt biking and motorcycle enthusiasts know, sometimes, you've got to leave the open road and take to the even more open trails. Off-roading is all about adventure, getting back to nature, and taking on dirt, mud, sand, and snow. 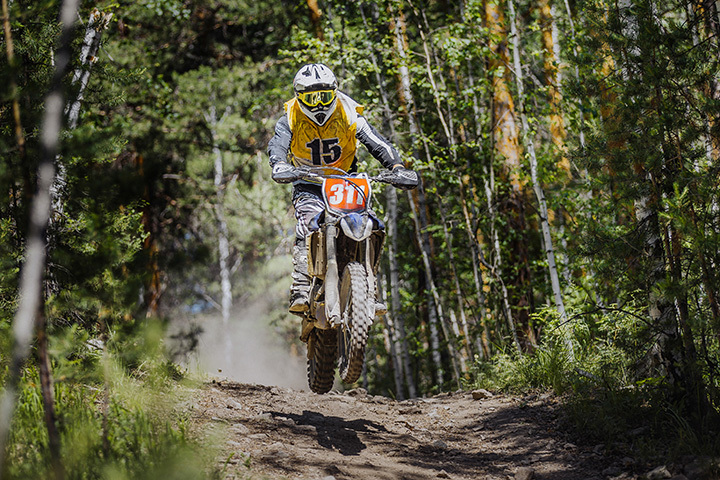 States throughout the country offer a wide range of OHV (off-highway vehicle) areas for dirt bike and motorcycle riders. We've collected (in no particular order) eight of the best places to hit the trail in the U.S.
Nestled between government bomb testing areas and the Mexican border, California's largest area of sand dunes has plenty of fun and excitement to offer motorcyclists and other "duners." Also known as "Glamis" and covering more than 20,000 acres of adventure, the Imperial Sand Dunes are the place to be for sand riding, with challenges for riders of every skill level, as well as exotic local flora and fauna and eye-popping scenery. Free or Fee? Permits are required during certain periods of the year. Tip for the Trip: The area is pure desert, so bring plenty of water and prepare to be self-contained if camping. Traversing Florida's enormous Ocala National Forest are a variety of trails designed for off-road enthusiasts. But these trails aren't for racing, jumping, or showboating. A trip along these winding routes is meant to be taken at a slower, more meandering pace - the better to enjoy the natural wonders at hand and learn about responsible riding in the wilds of America. Camping is available at multiple locations, so you can get (and keep) your bearings while enjoying the crystal-clear springs, rare flora and fauna, and fabulous (if capricious) Florida weather. When: Open year 'round, but temporary closures may occur during inclement weather. Free or Fee? Permits and passes vary. Tip for the Trip: The forest is a tangled and ever-changing environment. It's a good idea to set up base camp in the Big Scrub Campground and plan your rides from there. Motorcyclists and dirt bike lovers will find lots to love at Wayne National Forest in Ohio - home to the Buckeye State's largest OHV trail system. With three dedicated areas (totalling nearly 120 miles of trail) for OHV riders, this wilderness wonderland is the perfect place to slake your thirst for riding, regardless of your skill or experience. Courses vary from very easy to extremely challenging, and camping is on offer at various locations so you can take a break from the trail. When: Open April 15 to December 15, 24 hours a day, with occasional temporary closures possible. Tip for the Trip: Don't miss Monday Creek, the most popular section of the trails. It stretches for 75 miles and features a variety of experiences for riders of all skill levels. A one-stop shop for OHV enthusiasts, this privately-owned trail facility has something for everyone. Founded by "people working together to give you the most awesome time you can have off-road," Badlands is built on the site of a former quarry, and boasts "700 acres of sand dunes, wooded trails, pea gravel hills, mud pits and more." On-site food, shower, and lodging means you don't have to go back to the "real world" until you absolutely have to. They also have a dedicated MX racing track, so if you're looking to polish your racing skills as well as your trail mastery, they've got you covered. When: Open year 'round, 9 AM to 5 PM; closed Christmas and Thanksgiving. Extended stays available via camping. Free or Fee? Permits and pass rates vary. Tip for the Trip: The park offers a variety of holiday and special events, as well as "glamping" in on-site cabins and homes to allow for extended stays and longer riding. Off road, motocross, racing - this park's got 'em all. From hard riding in the mud bog to a variety of easy-to-challenging racing and off roading trails, this Alabama racing track is sure to please motorcyclists and dirt bike lovers (as well as ATV and other OHV enthusiasts). And when you're ready for a break from the adventure, you can play frisbee golf, go rock climbing, fishing, hunting, or even take a trip along a zipline. The facility also offers hotel and camping accommodations for those interested in turning their visit into a vacation. When: Friday, Saturday, Sunday 9 AM â€“ 6 PM. (9 AM â€“ 5 PM during winter) Inclement weather may close the park. Free or Fee? Membership required. Tip for the Trip: The park offers a variety of holiday and special events. Those looking to add a little warfare to their riding time can also partake in the park's Airsoft services. Built and maintained by volunteers and supported by the local community, this OHV park stretches over 1,850 acres and is the first of the Texas Motor Trail Coalition's developed properties. Barnwell caters to all kinds of off-road enthusiasts, from amateurs to experts, and offers a variety of amenities (including camping and showers) to help you make the most of your visit. When: 8 AM Friday to 6 PM Sunday, unless otherwise noted. Free or Fee? Memberships available. Fees vary. Tip for the Trip: The park offers a variety of holiday and special events. If you're looking for a little luxury with your ride, consider renting one of the bunkhouses, which offer satellite TV and A/C. Named for one of Appalachia's most famous feuds (much of which took place on the lands the trails now cover), the Hatfield McCoy Trails style themselves as "Trail Heaven" - and with good reason. Seven trail systems combine to create more than 600 miles of trails in the great outdoors, ranging in difficulty but skewing toward "challenging." The area is positively drenched in natural beauty, history, and lore, as well as plenty of accommodations and amenities for riders. Free or Fee? Permit fees vary. Tip for the Trip: The Hatfield McCoy National Trailfest is the major event for the park, and combines everything good about outdoor trail riding with an assortment of games, parades, events, costumes, food, and contests. It's time to think pink! 6,000 feet above sea level and covering more than 1,200 acres, the only major sand dunes on the Colorado Plateau are a uniquely gorgeous home for an assortment of natural wonders - and some of Utah's finest OHV riding. The shifting red sands can move up to 50 feet a year, but you can move much faster on your motorcycle or other OHV, thanks to 90% of the park's dunes being open to riders. When: Daylight hours, year 'round. Tip for the Trip: The unique location, as well as the ready availability of camping facilities, make Coral Pink Sand Dunes an ideal spot for extended riding vacations and plenty of amazing, one-of-a-kind photo opportunities.